The world of fiction is a vast sea from which heroes are born, tested, and celebrated. Stories have been passed down from generation to generation, becoming recognizable worldwide for their iconic characters who perform inspiring and fantastical feats. Classic literature, a hallmark of classroom reading and bedtime stories, is one such source of fiction. The often extraordinary, explosive, and exciting world of comic books is another. 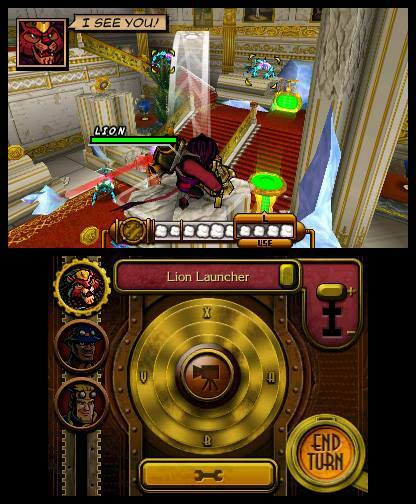 Code Name S.T.E.A.M., a new turn-based strategy game from Nintendo and Intelligent Systems, dares to combine the time-tested pages torn from the novels of old with the heavily-stylized, action-packed pages ripped from comics. What we get is a world of fiction unlike any other, but even in Code Name S.T.E.A.M. 's brilliant fictional world, fun gameplay, strong level design, and high quality production values are strictly nonfiction. 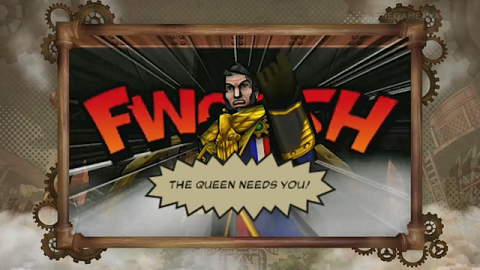 This isn't Intelligent Systems' first foray into the turn-based strategy genre. In fact, they have been making these types of games for decades. Advance Wars and Fire Emblem, military-themed and fantasy-themed strategy video game series, respectively, both got their start on Nintendo's Famicom in the late 80s and early 90s. Since their humble beginnings as 8-bit, Japan-exclusive titles, those two video game series have become known as some of the best in their class, garnering fans from around the globe for their memorable characters, great music, and rich gameplay. That being said...Codename S.T.E.A.M. isn't really like those games. It's still a turn-based affair, and its linage as an Intelligent Systems game is clear, but most of the gameplay similarities end there. It's a bold offering that establishes a new franchise with its own unique mechanics, but I think fans of Fire Emblem and Advance Wars will find plenty to like here. This game may be swarming with aliens, but it won't alienate those fans. What makes Codename S.T.E.A.M. so great is that it welcomes newcomers and veterans to the genre alike by design. It's quite challenging, but user-friendly and lenient when it counts. It upholds the philosophies that make Fire Emblem and Advance Wars so likable while being its own thing. As a new intellectual property from a storied development studio, it walks that fine line between familiarity and the unknown perfectly. As the game begins, a first-person perspective cutscene puts us in the shoes of someone opening up and flipping through a Code Name S.T.E.A.M. comic book. This reader's attention is sucked into the comic's pages and their imagination comes to life. From there, a scene introduces the player to a steampunk version of London where society is booming thanks to the advancements of steam technology. One of the first characters who appears in this prologue is an American Civil War veteran named Henry Fleming, who is based off of the same Henry Fleming from the war novel titled The Red Badge of Courage. He is just one of many characters that has jumped from literature to this comic-inspired video game. While Henry is working at the American Embassy, disaster strikes the building as an alien invasion throws a normal day into chaos. Our protagonist narrowly escapes the danger surrounding him and immediately starts to fight back the hordes of aggressive aliens. This is where the game begins to teach you the mechanics of Code Name S.T.E.A.M., starting with basic movement, attacks, and countering enemies. Movement is grid-based and played on a three-dimensional field. This means that you move around freely like a 3D action game, but the ground under a S.T.E.A.M. agent is covered in transparent white squares that indicate where your character can move during a given turn. This is similar to Fire Emblem and Advance Wars in that you can see each playable unit's movement limitations via colored grids. You can only perform a certain amount of actions per turn, and you do this by using steam. Steam is this game's form of "currency" that you spend on your actions. Anything from jumping down a building, healing a teammate, shooting an enemy, and moving around the environment uses up steam. For example, 6 steam icons could allow Henry to fire his signature weapon once, which uses three icons of steam, and then move three grids in any direction. For Tom Sawyer, the same amount of steam could be used to shoot his own unique weapon 4 times and then move up to 2 squares on the grid from that spot. When a character's steam depletes, they are locked onto one white square until the next available turn. Once you're satisfied with your steam usage, you'll hit the big "end turn" button and watch as the alien opposition slithers and scurries around your squad. You can't move during their turn, but a certain amount of unused steam can convert into an "overwatch" attack. These attacks catch those fiendish foes off-guard as they move in front of an agent that reserved enough steam to fire their weapon. Be careful though, as some aliens are also capable of performing overwatch attacks. If a character's leftover steam isn't used during the enemy's turn, it'll carry over into the next turn, allowing said character to move farther or perform more attacks. Your offense doesn't necessarily stop once your steam tank is dry. Each character has a special attack that doesn't have to use steam, so it can extend your offense or get you out of a rough situation. Each special attack can only be used once, so plan carefully! All of this may sound somewhat complicated, but the game teaches the player all of these mechanics and more with steam-refueling, floating signs that offer hints along the way without slowing down the action. There are also generator-like objects that allow you to save your progress in the heat of a battle and refuel your entire squad's health and steam, but they shut off after one use. These two elements combined can greatly extend your turn, prevent you from having to replay a bunch of turns if you chose to save, and provide useful gameplay tips. Despite these advantages, Codename S.T.E.A.M. can put up a good fight. Missions are tough, but each victory is satisfying! Code Name S.T.E.A.M. is a well-balanced experience that caters to the player without sacrificing challenge, and I love that. Be creative, and steamroll the alien menace your own way! Once a few missions are completed, Henry Fleming and his good friend John Henry, the second playable character whose origin is an American tall tale, come face-to-face with President Abraham Lincoln himself. The president leads the elite band of heroes known as Code Name S.T.E.A.M. as they counter the aliens bent on taking over the earth. It's as cool as it sounds, and the story only gets better from there. You'll meet all kinds of interesting, likable characters and visit a wide variety of places on your journey to squash the aliens. It's a fun, witty adventure that put a smile on my face on many occasions. The narrative alone is worthy of a real comic book series, but this is a video game after all, so these characters and locales aren't just for show. Each agent of Code Name S.T.E.A.M. has a unique weapon and class that can change how you play from one mission to the next. Some characters are more proficient than others at distracting enemies, attacking from afar, jumping long distances, and ambushing aliens. Combining these skill sets with secondary gear like steam boiler backpacks and secondary weapons gives the player multitudes of ways to beat each mission. These missions range from routing the enemy, protecting a checkpoint, reaching a goal, and so on. I always felt like I was doing something new because of the varied objectives and diverse battlegrounds. Once such mission has you fighting your way up a canyon from the bottom, while another pits you against aliens in tight corridors inside of a university. To top it off, there are even a couple of first-person, giant robot versus giant alien battles that puts you in the shoes of Honest Abe himself! Another point of interest is Code Name S.T.E.A.M. 's music. The soundtrack dynamically changes to suit your situation, staying atmospheric as you sneak around or wailing and rocking once you're on the offensive. I think fans of Advance Wars: Days of Ruin and its energizing soundtrack will really get into the invigorating melodies found throughout the game. Code Name S.T.E.A.M. also supports amiibo through the New 3DS and includes a multiplayer mode. With the power of amiibo, you're favorite Fire Emblem hero can fight alongside the S.T.E.A.M agents for a better tomorrow! Well, that's if you're favorite hero from the series is Lucina, Robin, Ike, or Marth. I only have one compatible amiibo, and that's Lucina from Fire Emblem Awakening. It's pretty awesome seeing her stylized to fit this game, and she comes prepared with some strong weaponry. 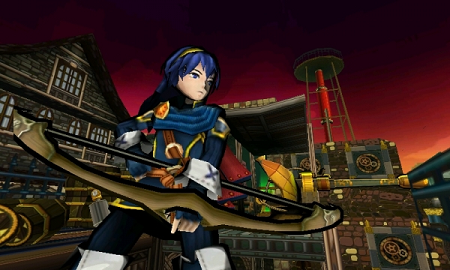 While her parallel sword works similarly to Lion's Lion Launcher gun, her secondary weapon is a bow that has relatively unique firing arcs. She's a welcome addition to the diverse roster of playable characters, and I think it's worth recruiting at least one of these amiibo if you're hip to Fire Emblem. I played the multiplayer mode after beating the single player game, but I use the term "played" sparingly. There's local and online multiplayer that contains three modes - Death Match, Medal Battle, and A.B.E. Battles. I failed to connect to anyone when searching under Death Match and A.B.E. Battles, but it seems like Death Match is a four on four battle between you and another person's S.T.E.A.M. team, while A.B.E. Battles are similar to the ones found in the single player mode. I did play some Medal Battle matches against someone, and in that mode you try to collect more medals than your opponent by the end of five turns. Each turn only last one minute, so every second counts! It's somewhat exciting, if not a little frustrating to be tied to a time limit. Also, I was soundly defeated in each of the three matches, so I left Code Name S.T.E.A.M. 's multiplayer mode with my head hanging low. I think I would have preferred unique co-op missions instead of simple death matches, because I think working together with someone else sounds more appealing (and less deflating) than what I experienced. At least the multiplayer mode's menu music is awesome. As is the case for every game, especially for a title kicking off a brand new series, Code Name S.T.E.A.M. has some flaws. However, these rough elements are few in quantity and dealt insignificant damage to my overall enjoyment of the game. Some aliens take more time planning out your doom than others, so an enemy turn will occasionally feel slow. There is a switch on the touchscreen to speed up these situations if desired, so this is the easiest flaw to overlook in the game. Speaking of aliens, some enemy types look too similar to each other. This can hurt when you're trying to make out the alien in the distance that could be safe or unsafe to walk past. It isn't terribly difficult to differentiate similar aliens, but the variety could be better. Also, when aiming at these foes, accuracy is a must. I occasionally felt cheated out of what I thought was an accurate shot, only to see bullets whistle past a target or hit something in the environment instead. I had the luxury of using the C-Stick on the New 3DS for camera control, but the face buttons on the system can be used for the same function. Those buttons make for less intuitive aiming, but they get the job done. As I mentioned before, these traits did little to disrupt the fun I had playing this game. Your mileage may vary, but I played Code Name S.T.E.A.M. for over 54 hours and didn't find a deep scratch among these scuff marks. A few flaws can steer people away from a video game, but sometimes a game's difficulty barrier will do the trick instead. Code Name S.T.E.A.M. is challenging, and though it may appear too challenging at a glance, I feel confident in saying that this is a newcomer-friendly strategy game. The difficulty climbs steadily, so it starts off with missions that give the player plenty of room to make mistakes and learn from them. Also, each environment has steam-powered stations that can refuel your health, steam, and allow you to save the game. With patience and proper planning, most dire situations can be turned around with the help of these stations. The difficulty level of Code Name S.T.E.A.M. is actually something that I would praise for its well-designed balance of fairness and adversity. If you're looking for a strategy game that is stimulating, but rarely frustrating, then this is the game for you. As the credits finished rolling and I was taken back to the title screen, I pressed the start button without hesitation to play just a bit longer. It dawned on me that I haven't finished a bunch of games patiently waiting on my shelf, so I reigned in those feelings and put Code Name S.T.E.A.M. back into its case. I'll return to it at some point, because I think it's one of the most creative, interesting, and enjoyable games on the Nintendo 3DS. I applaud Nintendo and Intelligent Systems for developing it, and I hope the series has enough steam left in it for a sequel someday. Do yourself a favor and pick this game up if you're into strategy games, and if you aren't, maybe this is the game that will make you a fan of the genre! This is Abe-solutely an instant classic in my eyes, just like the classic literature it draws inspiration from. I've been conflicted about picking this up, the reviews are all over the place. This just put me back in the 'buy' camp. Thanks Octo'! Nice review. You cover a lot, but one thing you don't touch on much is the difficulty of the game. It seems to have a reputation for being brutally difficult, so I was wondering what some more information on that would be. Is it difficult because each mission has one strict strategy you need to find and follow? Are there infinite spawning enemies? Is a map more trial-and-error at first to find enemy placements, but then you can tackle it a few different ways once you know? Is it only difficult to get a good rank on a mission, or is simply completing it tough? How long do missions usually take? Repeating like an hour of play can sure be annoying. Sorry for all the questions. I'm interested in the game, but I don't like difficult games, so I'm having trouble figuring out if I can handle it. I guess I could always use an FAQ. I'm glad that this review has helped you make a decision! I think this game is sensitive to newcomers and casual players. There are often multiple steam re-fueling stations per stage, so you get plenty of chances to heal up, steam up, and save your game. These functions cost medals, and will become more expensive with each use before resetting to the default price for the next set of missions. However, it's easy to amass a small fortune by simply defeating enemies and breaking medal-filled crates found throughout stages, so I never felt like I was running low on medals. The controls, touchscreen interface, objectives, and tips are all presented in an easy to understand way, so the learning curve isn't too steep either. Before each mission you select your agents and gear up. There's a "default" button that shows what characters the game recommends choosing for a given stage, but you're free to come up with your own combination. There were times when I would reset the mission and swap characters because I wanted to approach the mission from a different angle, and it feels like the game encourages you to experiment like this. Battlefields often have multiple paths and relatively complex designs, so there is plenty of room for different strategies opposed to there being one clear cut solution to a battle. Some maps have infinitely re-spawning enemies, but only some. It usually doesn't feel like a cheap way to make the game more difficult, but there were some instances where they became bothersome. Sometimes these reinforcements can be downright ignored if you've already created enough space between you and them or have dealt with most of the other aliens. These reinforcements can splinter your squad or force you to regroup, but it's an element in the game that I personally enjoy. I listed trial-and-error as a minor negative because sometimes a shot doesn't connect with an enemy like you were hoping it would, a level's design might catch you unprepared if you don't already know the layout, or you may accidentally take one too many steps and get attacked by an enemy via overwatch. If something like that happens, you can restart from your last save, restart the mission, or try to bounce back on the spot. All of these are viable choices to make after a bad turn, and you may find yourself briefly hitting walls like I was. After a few "test turns", you'll develop your own unique strategies and spend more time exploring and less time restarting. Missions are ranked by the amount of turns you take and if you have a full squad left once you complete your objective. You get a green check mark for fulfilling the goal or a red X if you don't. This just means that you get less or more medals after a mission, so it's no biggie if you're simply looking to beat the mission. You do get secondary weapons when you collect enough medals, but there are other ways to collect medals in this game. What you really want to do is collect the gears found throughout the game because they allow you to unlock new boiler back packs that affect your stats and steam. Nabbing these may require you to take extra turns or to alter your strategy, but I recommend collecting as many as you can customize each character to a greater degree. Some missions include up to three maps, while others may only have one. I'd say an individual map can take up to 2 hours to beat on your first try, but some are much shorter than that. My average was probably about an hour and a half per stage, but I play somewhat slow and redo turns often. The game is still pretty good at giving you a break when you need one. Like I said, you can save on a map, and you are asksed if you want to save in-between maps. I hope some of these answers helped. I don't think Code Name S.T.E.A.M. is an overwhelming game by any means, but it will challenge you. There are even different parameters you can set for a mission after it has been cleared to make it even harder! That stuff can be ignored though, so I would still recommend this game to you and anyone else who is interested, but reluctant to pick it up because of the difficulty. Holy moley, awesome review. I've been wanting to play this for a while, but for lack of time this will have to wait. But it will be my next 3DS purchase, no doubt. The improved enemy turn wait times (3x faster on New 3DS, f yeah!) are very welcome. Good review. I'm just waiting for a good sale to pick this game up. I love the premise and setting. The chunky Jack Kirby-esque artstyle hits my nostalgia bone (for stuff that existed before I was born). Not sure that Joe Six-Pack is equally intrigued by the setting, though. Unfortunately, it may never have the chance to become a franchise. Your impressions of the multiplayer were amusing! Indeed, great review. Well done! @Octorockin Thanks for the response, mate. I tried out the demo, and had some trouble before I fully understood how the Overwatch stuff worked, but after that it was smooth sailing through the demo stages. Like you said, I do remember some times in the demo where the cursor acted like a shot would connect, but then when I try it, it hits the edge of an object instead. That's probably the kind of thing I could pick up on though from playing, and figure out if an obstacle will block a shot even if it shows up as clear. What I suspected about this game is that many people were just trying to rush through the missions and complete them as quickly as possible, whereas from what you say it sounds like the best way is to take a more slow, methodological approach, as well as understanding how each character and weapon behaves and figuring out the best ways to use them. And that's why they found it difficult, but since that's usually the way I like to play games then maybe I can handle it. You know, using strategy. I wonder if some people expected this game to be more of a shooter than it really is, given the perspective and such, and tried to play it more like one. You might want to consider fitting some of that info into the review somewhere, since the difficulty of the game appears to be a major talking point for it. I edit one paragraph and added another towards the end of the review to better illustrate how I feel about the difficulty. Thanks for your input! Also, you brought up a good point. Treating Code Name S.T.E.A.M like an action game opposed to a strategy game may be what led to some player frustrations. It certainly has action elements, but it is a strategy game at heart. It pays off to play carefully, and a well-devised offense is still important. The Lucina amiibo I bought didn't come cheap, but as a fan of both Fire Emblem and Code Name: S.T.E.A.M., I'm nonetheless happy with my purchase. It's a shame that this cool feature is negatively impacted as a result of amiibo being difficult to find in stores, as is the case with other amiibo-compatible games.